Dr. Stoyan Chomakov, born in Koprivshtitsa in 1819. Doctor. Eminent fighter for Bulgarian church independence, a public and state figure. Member of Bulgarian Literary Society (today Bulgarian Academy of Sciences). Dr. Stoyan Chomakov came from the eminent Revival-period family of the Chalukov. He studied medicine in the Italian town of Pisa, graduated in Florence and specialised surgery in Paris. In the period 1848-60, he was the first doctor in the city of Plovdiv, and he opened the first Bulgarian pharmacists shop in Plovdiv in 1849. In the period 1861-77, Dr. Stoyan Chomakov was the representative of the Plovdiv Diocese in Constantinople. He actively participated in the struggle for church and national independence. After the Liberation of Bulgaria (1878), he got back to his doctors job, and became the Chairman of the Medical Insprection Council of Plovdiv. Dr. Chomakov was the first chairman of the charity organization St. Panteleymon, which supported poor sick citizens of the city, and also run the city hospital. As an eminent figure of the Liberal Party, Dr. Stoyan Chomakov was elected a M.P. in the Regional National Assembly, and is a member of the Standing Council of East Roumelia (1881-82). After the Unification (1885) he was Deputy Chairman of the Provisional Government of Southern Bulgaria. 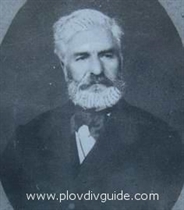 In the period 1885-87, Dr. Stoyan Chomakov run the city hospital in Plovdiv. In 1887, he was elected Minister of Education of the unified Principality of Bulgaria. He was a M.P. of the First and the Second National Assembly (i.e. Parliament).